I love oysters, and one of my favorite summer snacks is oysters on the half shell with a crisp, “minerally” white wine like Muscadet, Dry Riesling, Sauvignon Blanc or unoaked French Chardonnay. If you enjoy oysters on the half shell or just like to use the freshest most flavorful oysters possible for your fried oysters or other cooked oyster dishes, skip the pre-packaged oysters and buy them while they’re still in the shell. If you’re on the East Coast, Blue Points from Long Island and Wellfleets from Massachusetts are some of the most common types. Then, there are the more exotic varieties like Raspberry Point from Prince Edward Island in Canada. 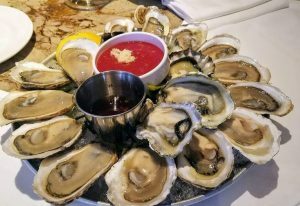 Generally East Coast oysters are brinier and meatier than West Coast oysters which are milder and sweeter in flavor with a more ripply shell. Kumamoto oysters from Washington State are frequently seen on restaurant menus that serve fresh oysters on the half shell. From what I’ve heard, Miyagi oysters are the best oysters from the West Coast, although I have never tasted them. Oysters from Louisiana and other places in The Bayou have a more distinctive earthy flavor that lend themselves to grilling, frying and condiments. I’m partial to East Coast oysters, because that salt water flavor is just so appetizing. The trick to shucking oysters on the half shell at home is getting a good oyster knife and finding that crevice on the oyster that is willing to give in to your prying. It may take several attempts, but the key is patience. Those shells didn’t develop overnight. Don’t have the patience or desire to shuck oysters at home? If you’re in New York City, Aquagrill Restaurant in SoHo has one of the best oyster bars in the city.